Dell will bring virtual reality to more Windows and Android devices next year, replacing 2D cameras with depth-sensing 3D cameras. The depth-sensing camera is for more than just selfies and Skype videoconferencing. It is able to go deep inside images to track depth and provide information such as distance between objects. 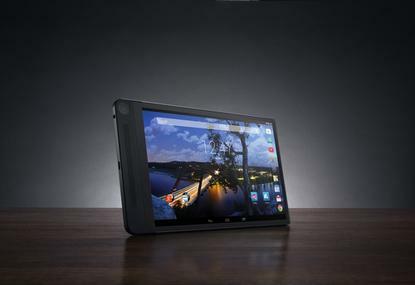 Dell later this month will introduce its first tablet, the Venue 8 7000, with such a camera, and more tablets and PCs will come next year. "I'm not investing in a 3D camera only for this product. My road map cascades it across Android and Windows [devices] through next year," said Neil Hand, vice president of Dell's tablet group, in an interview. The 3D camera in the Venue 8 7000 could be used for augmented reality, measurements and 3D scanning and printing, Hand said. For example, it will be able to provide rough measurements of rooms that would be useful to real-estate brokers. The Venue 8 7000 is also able to determine the size, shape and contours of objects. Software on the tablet allows manipulation of 3D images to change colors, add special effects or reshape multiple layers. 3D stereoscopic cameras have been used in mobile devices before, but depth-sensing cameras can better identify objects and spaces. Google has installed a depth-sensing camera in its Project Tango tablet with the goal of helping it identify objects, and ultimately to be able to tell what a 3D image is. The 3D camera in Venue is based on Intel's RealSense technology, which has been under development for years. Intel's version of the camera for laptops and desktops will be able to identify people and moods, and also recognize gestures. For example, the camera will track lip gestures to identify if a person is happy or sad. Intel has partnered with Microsoft to make Skype videoconferencing more enjoyable with the RealSense cameras. A hands-on test of the Venue 8 7000 in September found that it was accurate within a few millimeters. The Venue 8 7000 camera provides a relative estimate of distance, Hand said. Dell has seen an accuracy rate ranging from 95 percent to 99 percent depending on the distance, lighting and other conditions. "Once you go beyond 6 meters, accuracy drops off really quickly," Hand said. Measurement inaccuracy may be an issue for users, but Hand said Dell is working to improve the accuracy rates. "We're doing a lot of work to calibrate how the camera system is as effective as it can possibly be," Hand said. Dell hopes to ship the Venue 8 7000 starting at US$399 by the end of November.